Reliable, robust and simple to operate, the 1.2m Low-Stow Vehicle-Mount / DriveAway Mobile VSAT antenna features an offset 1.2m core-free carbon fiber reflector paired with a patent-pending AvL Cable Drive positioner. 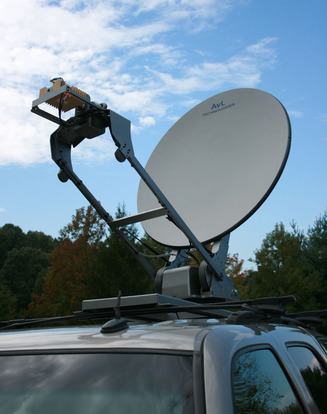 The antenna can be mounted on a large SUV, van, or larger vehicles and trailers. Created for use where performance really matters, AvL's Vehicle Mounted Mobile Broadband systems enable video, voice, IP and data communication anywhere in the world, with the push of a single button. The precision of AvL's patent-pending AvL Cable Drive positioners paired with the ease of one-button Auto-Acquisition and superior technical support make our vehicle mount antennas ideal for non-technical antenna operators. Questions? Email an AvL Representative here: Sales or call an AvL representative today at +1 828 250 9950.